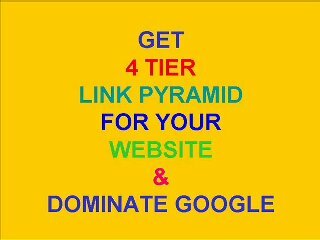 I will create a Search Engine Friendly Recent Penguin Panda Safe, a super powerful 3 tier Link Pyramid to give a great boost to your Website. - 1st tier 10 High PR web 2.0 Do Follow properties , - 2nd tier 40 Do Follow Social Bookmarks, - 3rd tier 100 High PR Wiki Links, *Blog Commenting has been penalized by Google Penguin, hence I won't be doing it. Dominate Google with this unique service.